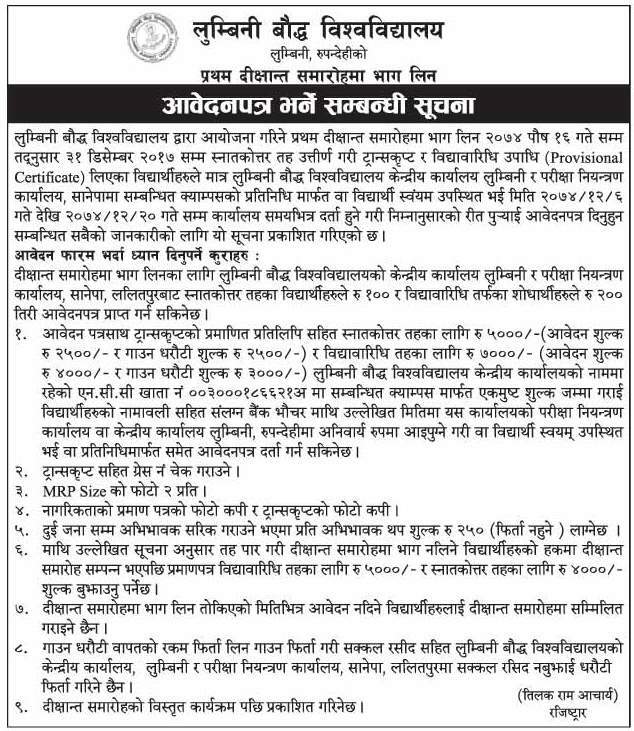 Lumbini Bouddha University has published notice regarding its First Convocation Ceremony.The notice calls for application for students to participate in the First Convocation Ceremony of the University. Students who graduated from the Masters Level till 2074 Paush 16 ( 31 December, 2017) and have received their transcript and Provisional Certificate can register themselves either in person or by the representatives of networking campuses to Central Office of Lumbini Bouddha University or Office of Controller of Examination, Sanepa. The application form should be submitted from March 20, 2018 to April 3, 2018 within the office time.